Both the final and the 3rd/4th Play-off are two encounters we’ve already seen play out once before at the OFC U-16 Championship, however that doesn’t mean we should expect a repeat of those results. 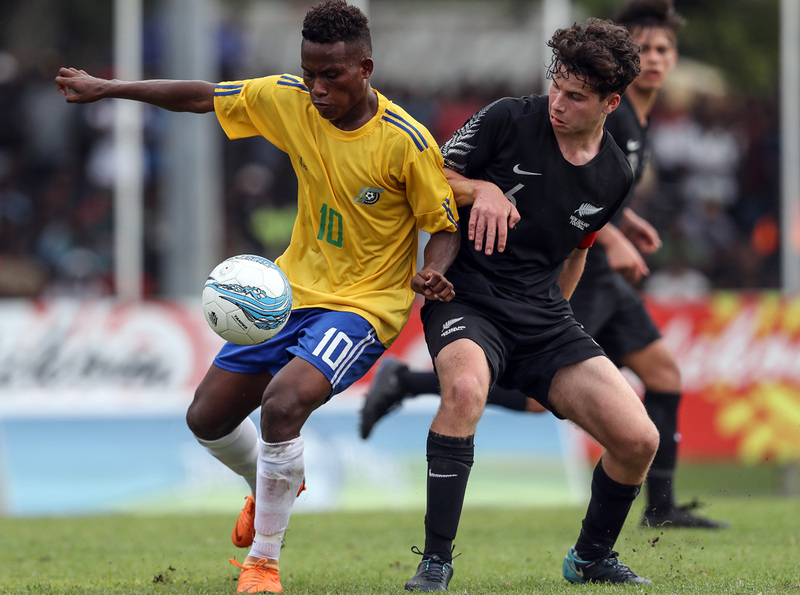 After qualifying for their first-ever youth football world cup, Solomon Islands will be taking on New Zealand in a bid to continue their historic run with the competition title. As defending champions, New Zealand don’t want to release their grip on a trophy they’ve had in their possession for the past six editions. When it comes to finding the motivation to win this final match, the Kiwis don’t have to look far given they’re still smarting from the comprehensive defeat at the hands of their hosts in the group stage. While they bounced back in the semi-finals to secure their berth in the FIFA U-17 World Cup with a 4-1 win over Tahiti with a performance coach Jose Figueira had been waiting on, the job is not done as far as the team is concerned. “We’re in countdown mode now,” Figueira said. Looking more specifically at what has changed since the 5-0 defeat at the hands of an organised and lethal Solomon Islands side Figueira said lessons have been learned. “We learned a lot from that game. I think it was an experience – the crowd, the talented team that they are – it probably might have come a bit too early for us in terms of settling in and getting used to things here,” he explained. The best match to date for the New Zealanders was their semi-final against Tahiti with the squad seemingly finding the right balance – at just the right time. Marko Stamenic was in control in the middle of the park while Oskar Van Hattum and Henry Hamilton were looking lethal up front any time they were in possession. Going into the final, what will be key for New Zealand is continuing that momentum and continuing to apply what they have learned thus far. “One of the key things since that group game against the Solomons has been our organisation, with the ball but especially in and around the ball and behind it to try to deny counter attacks and being ready in those transitional moments to both cover the space and try to win the ball back quickly. Having outplayed New Zealand once, doing it twice isn’t impossible but it will be difficult for Stanley Waita’s charges. Part of their strength came from surprising their opponents with their speed, power and hunger. They’re still hungry, there is no doubt about that, but New Zealand now know what to expect from this exciting young side who will need to lift their game one more time to secure the silverware. And with a hugely excited, positive home crowd backing this young side to continue their glorious run, there’s every chance they could once more lift their game to try and deliver what the fans want. “I’m feeling excited,” Waita said. “After the match I was feeling a bit tired, but today I’m feeling excited because I think it’s going to be another great day for Solomon Islands. “It’s a grand final and my players are feeling great too. We are looking forward to it and will give our very best tomorrow in the final. In the 3rd/4th Play-off Tahiti will take on Fiji in what will be a hard match for both sides to play considering they had hoped to be playing in the afternoon encounter. Fiji put up a good fight against Solomon Islands in the semi-final with a performance worthy of victory, but unfortunately they just didn’t quite have enough in them to bring down this well-drilled opponent. Still working on putting that hurt behind them, Fiji are regrouping and aiming to go out onto the pitch at Lawson Tama Stadium one more time and get a result they will be happy with. Coach Yogendra Dutt knows what his side is capable of and can only hope that they have the mental strength to perform to the best of their abilities. “We know that we’ll be facing a strong opponent in terms of Tahiti, we’ve played them once and I very well know they will have a strategy to try and topple us again. For Tahiti, the sting of having come so close, but so narrowly missed out is still present. They always knew that meeting New Zealand in the semi-final would be a difficult task and they were certainly given a harsh reminder of why the Kiwis have six consecutive titles at this level. “Are we ready? That’s a good question,” Tahiti coach Hermann Aurentz said. Aurentz knows his side are still hurting, still thinking about the possibilities and opportunities they have missed out on. However he also knows that they have the capacity to go out and deliver a performance they can be proud of. “We know that Fiji will give 150 per cent in this match because we met them in the group and they were a strong side. “I’m confident in my team, we’ve been working hard to boost the morale back up and get them ready to go out and claim this final victory,” Aurentz said.